I’ve probably read The Awakening four times by now, and I’m heading into my fifth read, this time for the sake of the online classics group I moderate for the library. While this is a very short novel, it packs a very powerful punch. This is the only work by Kate Chopin I’ve managed to fit into my reading rotation to date, and every time I read it I vow I’ll change that. Yet, every time comes and goes and still I’m admitting I haven’t managed to do that. 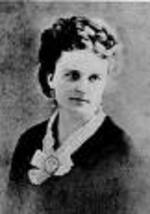 In Kate Chopin’s novel the main character is Edna Pontelier. Edna’s still a relatively young woman who’s married and has a child. She’s neither particularly happy nor particularly unhappy with her marriage, but she one thing she isn’t is fulfilled. Partway through the novel Edna realizes what she thinks she wants, what will fufill her, and that is to get back into drawing and painting, former hobbies of hers that she’s become interested in again. At the same time, she also becomes interested in another man. The fact her husband is away on business so often exacerbates this situations. She falls desperately in love, and fate takes its course. All this is told against the backdrop of steamy, sultry Louisiana. The story is told in a wonderfully sensual, languid style, but what happens in the book is anything but laid-back. What ultimately happens is horrifically shocking, like a bucket of cold water. The denouement sent me reeling the first time I read the book. It angered me, and for a time I didn’t like Kate Chopin for what she chose for Edna. However, after a cooling off period, and a subsequent re-read, I saw things from a more level-headed perspective. It became clear to me then it wasn’t just about Edna Pontelier. It’s about the situation of women in general, and the stifling nature of their role in turn of the 20th century society. It’s about desperation, and the lack of any real, acceptable choices for women. The ending was still shocking and sickening, but after a few more years’ life experience it at least made a little more sense to me. The Awakening was published in 1899, but it’s an incredibly modern-sounding, forward-thinking novel. The book addresses the basic theme Virginia Woolf will write about in her 1925 series of essays published in the book A Room of One’s Own, taking on the male-dominated establishment and asserting the right of women to not only have artistic talent, but to act on it, too. In addition, it asks the question how much of herself a woman must give up so that her family may thrive, and whether she can reasonably expect to have a fulfilling, “other” life outside of the family circle. The answer to that last question will differ with every reader, and I myself am not sure if I could hand down a pronouncement with any degree of surety. What complicates things is Edna has a son. If Chopin hadn’t added a child to the equation my answer would very likely be different, but with that child comes a whole other set of issues involving moral responsibility. Even taking away the supposition of maternal love and bonding, there’s still that very large, looming issue of ethics. The fact remains, whether the mother feels she wants the child or not, he’s still there, and she’s still responsible for him. The Awakening is most often taught today as a feminist classic. While that remains true, it’s also a humanist classic. What it teaches is there’s a whole other half of humanity that isn’t male, and that at least in a great number of cases that half may not have gotten a fair shake. You may argue for Edna or against her, but whatever your stand you can’t argue with the rage behind Kate Chopin’s novel. That rage is part of what spilled over into the 20th century, leading to the women’s movement and all the subsequent changes in attitude toward the role of women in society. As such The Awakening is a pivotal work of fiction. I’m looking forward to delving into it all over again. Thanks for the lovely post. The Awakening holds a special place in my heart, since I am from coastal louisiana, and have spent alot of time in both New Orleans, and Grand Isle. Your take on it was right on. This is such an important book for women. Sheri, I’m glad you enjoyed the post. I very much enjoyed the writing of it. Writing about the South is very satisfying to me on many levels. It really gets at the heart of me. Elaine, I like your point about Edna’s guilt as one of the reasons the book ended as it did. It was likely a combination of things, the failed romance, the doomed “career” and the overriding sense of guilt that were just too much for her to bear. I’ll pay closer attention this time around to how Edna reacts to her son, and how much her love for him affects her. I can’t remember off-hand how much affection or attention she showed him. It’s all blending together with Madame Bovary for me, as the books are so similar and I just re-read that one recently. I also agree on almost feeling sorry for Edna’s husband, who was blindsided by it all. He wasn’t a horrible man. He didn’t fully appreciate his wife, but had he been given the chance the question remains, would he have ultimately supported her in what she wanted to do if she had just asserted herself instead of running away? That was the question that bothered me. Of course, the other men are another issue, and I’m not sure how much she really wanted them and how much she just wanted excitement. It’s pathetic to think what she brought on herself just looking for release from what she saw as a humdrum existence. Lots to discuss in this novel. I’ve almost written another post here!